The Crystal Ballroom gets its name from the large, imported Italian chandelier hanging above the dance floor. The Ballroom is available for rental for your private parties and celebrations. Whether its a wedding, reception, Christmas party, reunion or other private gathering we have the facilities to meet your needs. If you are having your event catered, our kitchen is available for your caterer's use. Our Ballroom boasts a huge 3,500 sq ft dance floor complete with stage. A full service bar is available. It has an upper and lower level with the lower level being handicap accessible. With our seating capacity of 500 people and 3-acre lighted parking lot, there is plenty of room to accommodate your guests. When renting the Crystal Ballroom, access to building is 9 AM on day of event until 11:00 PM. The above pricing is for Saturdays. This rental includes ballroom, banquet room and kitchen. 1/2 of rental fee is required to secure date. This is a non-refundable deposit. Our ballroom only is available for hourly rental at $75.00/hour, minimum of 2 hours. A building manager will be present at all times at $12/hour. A cleanup fee of $125.00 is also required along with 1/2 deposit to secure a date. If kitchen is needed for cooking, etc., $50/hour is charged. Atmosphere/Decor: Seats 500 with a stage and full bar. Special Features: Handicap accessible to the main floor. Our banquet room is available for hourly rental (as long as there is no other event scheduled). $30.00/hour-2 hour minimum. Room must be left as found. Atmosphere/Decor: This room contains 8' tables that will seat approximately 72 people. Special Features: Access to kitchen. If cooking is needed, extra fee is required. 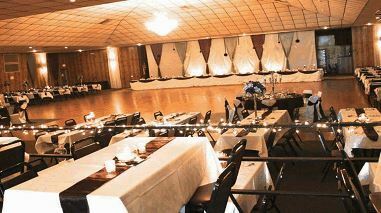 Special Features: Our building can be rented for receptions, fund raisers, etc. Or our smaller banquet room is also available for bridal/baby showers, birthday or anniversary parties, small reunions.